Starting just below the large rapids of Browns Canyon, the Lower Browns Canyon section of the Arkansas River offers fast-moving water, with just a few mild rapids. This section is a great alternative to Browns Canyon if you have young children or are looking for a scenic, slow float. This area is popular for fishing or for trying out inflatable kayaks. As you raft past large cottonwood trees and green pastures, take in the stunning views of the snow capped 14,000 foot Sawatch Mountains. 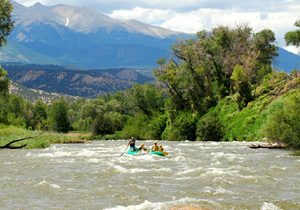 Recommended For: Fishermen, inflatable kayaks, beginner kayakers, families with small children or those on overnight trips floating down from Browns Canyon headed to the lower river. Enjoy a gentle stretch of the Arkansas River on this mild and mellow half day adventure. 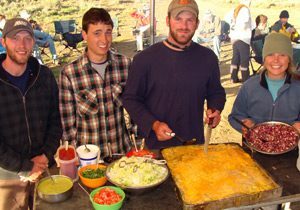 This family-friendly trip departs from Buena Vista, Colorado – close to Denver and Colorado Springs. Young kids ages 4+ and rafters of all skill levels love this trip that runs between May 1st and Labor Day. Beautiful scenery and exceptional guides make this trip a guest favorite! Notes: Lower Browns Canyon is a wonderful alternative to Browns Canyon if you have children that cannot raft Browns Canyon due to age restrictions.